Featuring Cornerfest at Cornerstone, Pet Parade, Spats Retro Dance Party, arts and crafts, sports demos, street food, outdoor reading & shopping parklits. 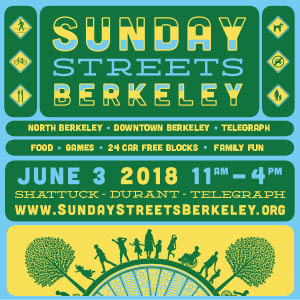 Sunday Streets Berkeley is happening on June 3rd, from 11-4PM. This is a huge FREE community event for everyone to enjoy the selected closed off blocks of Shattuck, Durant, and Telegraph. People of all ages will be able to stroll, cycle, dance, and joyfully play, including your pets, in the closed off streets of Berkeley! This year we’ll have featured events in the downtown, such as… a Pet Parade, Cornerfest at Cornerstone, Spats Retro Dance Party, arts & crafts, street food, dance performances, and more. Everyone from businesses and community organizations to musicians and artists use the space creatively, engaging the public and providing spontaneity and discovery. You can’t miss this awesome summer event!! Shattuck will be closed to vehicle traffic on Shattuck (Vine to Channing, then closures continue up Durant to Telegraph and then Telegraph (from Bancroft to Dwight) on June 3 from 9AM-5PM. Please see map below for details of route.